Augusto Fornari (fl. c. 1853 - 1866) was a Rome based map publisher active in the middle to late 19th century. His publishing firm focused on guides and plans for tourists in Italy. 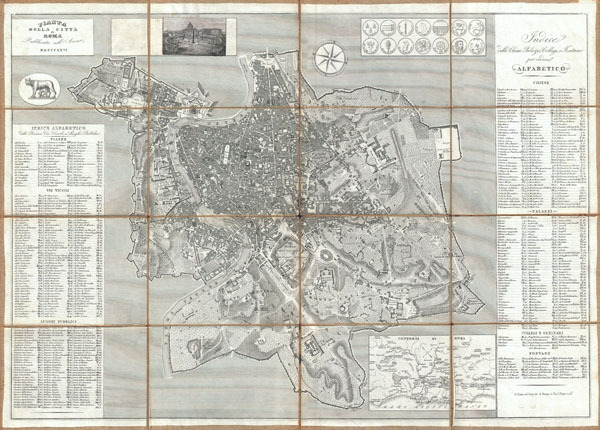 His corpus includes several maps of Rome, which he updated yearly, as well as a few maps of other Italian cities and of the Italian countryside. Little else is known of this elusive publisher. Very good condition. Disected and mounted onto linen in 16 sections. Original linen backing and edging in excellent condition with only minor wear at fold interesections. Comes with original orange marbled slipcase, which has several tape repairs. Roma, Biblioteca Romana presso l'Archivio Storico Capitolino Cart_XIII_46, IDp: 270/ IDc: 465. Ceen, Allan, Roma Delineata, 1748-1870.